There are many solutions available to help alleviate the symptoms of age-related hearing loss, as well as prevent further damage to your hearing in the future. Hearing loss is often an inevitable effect of aging on our bodies. However, this does not mean that you have to live with the symptoms and miss out on all of the music, conversations, and sounds of your life. There are many solutions available to help alleviate the symptoms of age-related hearing loss, as well as prevent further damage to your hearing in the future. If you are suffering from age-related hearing loss, consider these easy ways to recognize it and alleviate your symptoms for the future. Age-related hearing loss typically includes a growing difficulty of processing certain sounds, such as high-frequency sounds or pronunciations in speech. If you notice that you are struggling to hear certain sounds in conversation, you may be experiencing some of the earliest stages of age-related hearing loss. You may also notice that you have trouble distinguishing sounds in particularly noisy environments, such as environments where music may be playing or mechanical sounds may be present in the background. This can also include other symptoms such as ringing in your ears, dizziness, or muffled sounds. If you are experiencing any of these symptoms, be sure to call your audiologist as soon as possible so that you have access to resources such as hearing aids or cleaning solutions that may help you to hear better in the future. The right solutions for age-related hearing loss are completely specific to the needs of each individual and the stage of your hearing loss. For individuals with advanced hearing loss, a hearing aid may be necessary to hear throughout the day. For those with less advanced hearing loss, a simple cleaning of your ears may do the trick for allowing you to hear more easily without wax buildup or swelling in your ears. To find the right solution for you and your specific needs, it is especially important that you consult your audiologist, as they can guide you towards the best solution for you and your lifestyle. Need help with your hearing? Clarity Hearing can help. Clarity Audiology & Hearing Solutions is an independently-owned and operated clinic that focuses on quality of care and personalized friendly service to the surrounding areas of Ellicott City, Catonsville, Columbia. 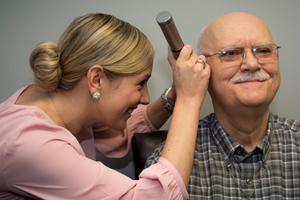 Our Doctors of Audiology are highly trained with advanced degrees and take the time to provide the personalized care and attention that you need and deserve. We provide advanced hearing aid options that personally calibrated with cutting-edge digital technology to fit your hearing loss, your unique ear anatomy, and your individual listening needs. This entry was posted on Friday, May 18th, 2018 at 2:15 pm. Both comments and pings are currently closed.